Nothing looks like Chicago at night with its captivating skyline and lights reflected in the water. You can find thousands of photos and paintings of that if you do a quick Google search. 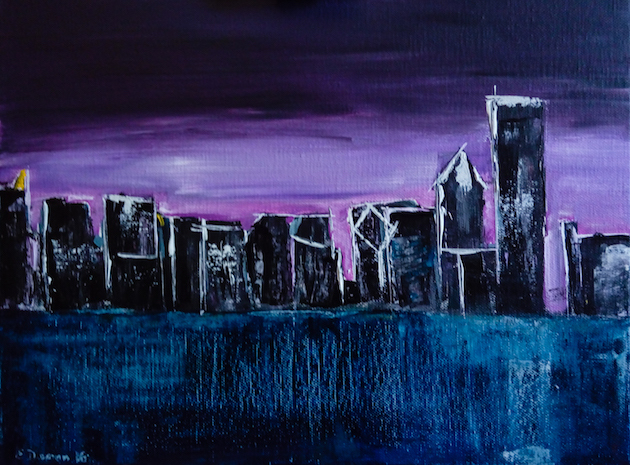 My Chicago skyline abstract painting shows Chicago at night too, but it’s different from the rest because there are no lights and only a hint of reflections. I thought that it would be fun to have a bit of a blackout and only use bits of dirty white to highlight the skyscrapers. The Willis Tower is also not there because, you know, everybody has it in their art, yet Chicago skyline looks just as fascinating with that skyscraper just around the corner (or off the border of my canvas)! 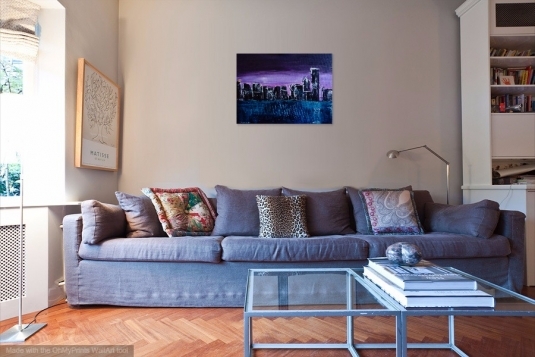 This Chicago skyline abstract painting shows the city on a very frosty morning when it stands quietly over frozen Lake Michigan. The city is waiting to wake up and there’s only a touch of light in the deep purple sky. The whole painting has a bit of a ghostly feel.